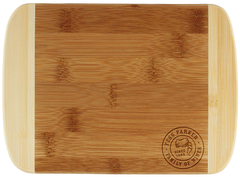 The Totally Bamboo 2-Tone Bamboo Bar Board is a functional and beautifully crafted board for your bar or kitchen. This cutting board has a compact and lightweight size that is easy to store and lift, and perfect for prepping lemons, limes, celery and other bar garnishes. Each Totally Bamboo piece is distinctively attractive and super strong. All Totally Bamboo products are made from sustainably sourced bamboo and their factories adhere to a very stringent protocol for curing and processing the bamboo, ensuring the highest quality product. Hand washing is recommended. Measures 8" x 5 3/4" x 1/2"